As Marvel and DC Comics continue their cinematic battles of one-upmanship, as fought by their studio surrogates, Disney and Warner respectively, the stakes keep getting higher and higher as both studios attempt to lure audiences in by cramming as many superheroes as possible into a single two-hour or so movie. 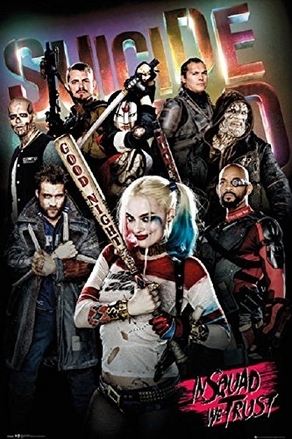 After Marvel turned Captain America: Civil War into a battle royal pitting a dozen of their finest heroes against each other, DC gives the genre a new twist in Suicide Squad by creating a new team… of supervillains reluctantly drafted into the service of the good guys. Alas, while the concept and some of the performances are good, all too often the plot and execution are lacking. The premise behind Suicide Squad is that we can’t rely on our superheroes to protect us from the forces of evil since they might well turn out to be evil themselves. So a hardnosed government bureaucrat, Amanda Waller (Viola Davis, channeling her character from How to Get Away with Murder) decides to form a team of supervillains and blackmail them into going on dangerous, possibly suicidal missions. Their motivation, besides getting out of their maximum security prison for a few days, is to avoid having the explosive device on their neck collars blow them to bits. The villains are introduced in a series of sequences that get progressively shorter as the movie goes along, as if writer/director David Ayer realized he was running out of time and sped up his introductions to save time. 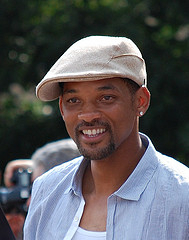 First, there’s Deadshot (Will Smith), an assassin who’s, well, a deadly shot, but whose soft spot is his 11-year-old daughter. Then, there’s Harley Quinn (Margot Robbie), formerly a psychiatrist treating the Joker who fell in love with him and went nuts herself. Next is El Diablo (Jay Hernandez), a former gang banger with a gift for starting fires with his mental powers. Another member of the squad is Captain Boomerang (Jai Courtney), a whiz with, you guessed it, boomerangs. And, finally there’s Killer Croc (Adewale Akinnuoye-Agbaje), a guy who looks like a human crocodile and is really at home in the water. Noticeably absent from this listing, you may note, is the Joker, probably the best DC villain of all time, who is not, however, absent from the movie. As prominently billed and played by Jared Leto, he does show up, from time to time, primarily to pursue his romance of Quinn, even when she’s in prison. This might come as a disappointment to those unfamiliar with the source comic material, who might assume that the Joker is a key member of the Squad. That’s not the only disappointment audience members will receive. While Ayers’ screenplay does a fairly good job of describing the rationale behind the formation of the Squad, their actual mission, and the way they go about it, is confusing in the extreme. It seems that an evil spirit of a long dead witch called the Enchantress has taken over the body of archaeologist June Moone (Cara Delevingne), who unearthed the Enchantress’ tomb. The revived Enchantress has hatched some sort of plan to take over or destroy the world (the details were never made clear) in a blaze of CGI special effects. In other words, it’s the exact same plot as you’ve seen in the last dozen or so superhero movies. Once the Suicide Squad begins making their way through the dark, gloomy streets of Midway City towards the Enchantress’ lair, they encounter veritable armies of demons, terrorists, or, perhaps, demons disguised as terrorists and blast their way through. There’s plenty of very loud action, but it’s mostly people shooting at or trying to bash each other. I can’t recall a single memorable fight sequence, and only character who made an impression during the combat is Quinn. In fact, it’s Margot Robbie’s lively, way off-center performance and Will Smith’s more laid back but nearly as effective performance that make Suicide Squad at least tolerable. Robbie steals every scene she’s in with a mix of overt sexuality, feigned childlike innocence, and clever quips. Her performance highlights one of the film’s bigger problems, the need of an R-rated treatment. This is decidedly adult material, with Quinn bashing in people’s heads with a baseball bat on numerous occasions. Yet, the film’s PG-13 rating limits the amount of gore that can be shown, not to mention constraining the dialogue and any overt sexuality. Deadpool (albeit a Fox production) understood that some comic book material merits an R-rating, but Warner’s quest for a more family-friendly audience limited David Ayers’ options. It’s clear that Ayers is out of his depth in Suicide Squad. His storytelling in other movies is generally crisp, and action sequences, such as the tank battles in Fury, are easy to follow. Here, however, the film simply doesn’t look good, and the special effects, while frequent and often overbearing, don’t dazzle, and, when used in the action sequences, wind up resembling being in the middle of an exploding fireworks factory. Warner desperately needs to find the right director to work with this type of material for its numerous future planned DC films. If you want to see how this type of material could, and should, have been handled, look back, not to other comic book films, but to a much earlier version of this same story. In 1967, director Robert Aldrich told a story of a group of criminal misfits pressed into duty on a near suicidal mission. This time, the enemy wasn’t a centuries-old witch and an assortment of demons, but, rather, some flesh-and-blood Nazis, and the movie became an acknowledge war classic, The Dirty Dozen. A key difference between the films is running time; Aldrich’s movie lasted a good half hour longer than Suicide Squad, long enough to establish character and add a second major coherent action sequence, as opposed to the type of generalized mayhem that’s a constant in Suicide Squad. Ayer and Warner have assembled a good cast in Suicide Squad, and they are the film’s saving grace. The few scenes in which they slow down and talk are the best in the movie, which, not coincidentally works best when Robbie and Smith are given more to work with. Other characters don’t fare as well, especially Joel Kinnaman, who plays the modern version of Lee Marvin, the military officer responsible for keeping the Squad in check. However, not even the cast from the Dirty Dozen itself could have turned Suicide Squad into a good movie. Instead, the film ultimately becomes its own version of cinematic suicide, death through numerous self-inflicted wounds. In this scene, Joel Kinnaman lays down the law to the members of the Suicide Squad. © 2016 Steven R. Silver. All rights reserved.